Quick review of Spin Win. I don’t quite know how to describe Spin Win, except that it’s an absolute gem that all good games websites should have in their repertoire. 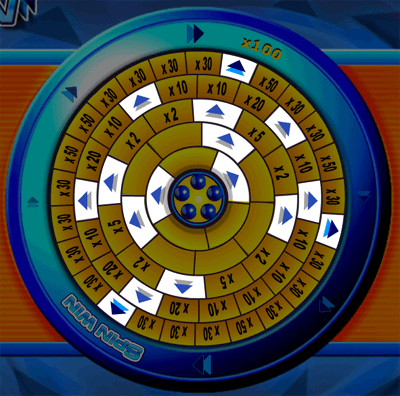 The game involves spinning steel balls around different layers of a wheel and hoping that they land on win-multiplier segments. The aim of the game is to get as many of the balls in to the outermost rings of the wheel as you can. The further out the ball lands on the wheel, the bigger the win will be for that ball. In spite of my terrible explanation of how it works, Spin Win is actually a fairly simple game that works incredibly well and will keep you playing for longer than you should. Spin Win fun rating - 85%. Spin Win is a ripping good laugh. As with most numbers games it’s all very much luck. However, that’s not really a problem with Spin Win as it’s such a pleasure to watch the balls whiz round the rings as you wait in anticipation. …and that’s what makes games like Spin Win so good - the anticipation. There is a constant feeling of tension and excitement as you watch the balls slow down and travel toward the segments that will move the ball further up in to the bigger win sections. It’s a straightforward game, but sometimes that’s all you need to create great fun and excitement in an online real money game. Select the number of balls you want to play with. Choose the stake for each ball. Set the balls in motion and watch them whiz around the rings. There are 6 rings on the Spin Win wheel. Each ring is cut up in to segments. Some of these segments have arrows on them, which will push any ball that lands on in it in to an outer ring. The outer rings have much bigger win multipliers than the inner rings, which means that you will win far more money if one of your balls makes it to the outside of the wheel. The first 2 rings have no win multiplier, just arrow segments. Balls that do not land on arrows in the first two rounds are lost. Each ring acts as one "round" in a game of Spin Win online. 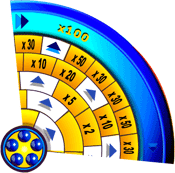 Once all of the balls have landed on a no-win or multiplier segment, the game ends and your winnings are calculated. If one or more balls lands on an arrow segment, the lucky ball(s) move to the next ring and the game continues. Before the game of Spin Win starts, you have to choose how many balls you want to play with and how much you want to wager on each ball. You can play with up to 100 balls in one game. 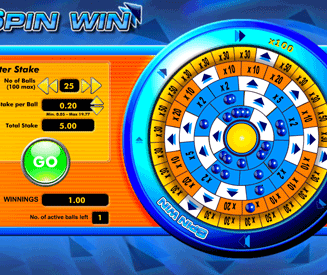 So for example, if you wager 10p on each ball and you play with 25 balls, your total stake for the game would be £2.50. Fact: The less balls you play with, the less likely it is you’re going to have a ball end up past the first two rings and in to the money-making rings. If you’re more of a conservative player, you may want to choose a high number of balls and wager a small amount on each. On the other hand, if you’re happy to play a high-risk game with the potential of bigger wins, choose a small number of balls with a larger amount of money on each. Note: I find it more entertaining to play with a fewer number of balls (25 or less), as this way you can keep an eye on the balls as they spin and the excitement is greater. Ideally you want as many balls as possible to land on the arrows. The least desirable segments are the no-win segments in the first two rings (or "rounds" as you could call them).